The Skyrail Rainforest Cableway in Cairns was no doubt one of our favourite experiences and a Must-Do when visiting Cairns in Tropical North Queensland, Australia. 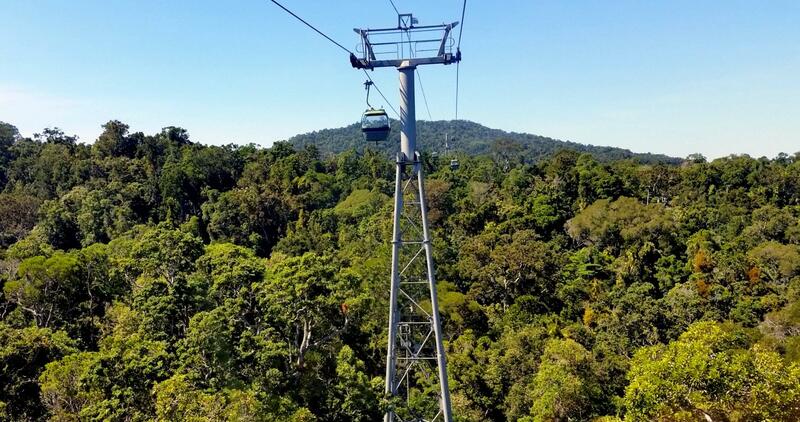 If you only have one day in Cairns, Skyrail Rainforest Cableway is our top tip for things to do. Over 7.5 kilometres Skyrail allows you to glide just meters above the rainforest canopy in Barron Gorge National Park, a tropical rainforest and among Queensland’s most picturesque parks. A veritable sustainable tourism leader, Skyrail has been committed to environmental best practice for many years, winning multiple awards for its sustainability commitment, both nationally and internationally. The Skyrail experience includes time at two rainforest stations – the Red Peak board walk and Barron Falls, which offers spectacular view over Barron Falls and hosts and interactive rainforest interpretation centre. Different options to experience Skyrail Rainforest Cableway include the Canopy Glider, an open gondola offering 360 degrees panoramic views of Tropical North Queensland (highly recommended), the Diamond View cabins with glass floors (pretty cool), and the “normal” cabins for those not that keen of heights. Skyrail’s 114 gondolas travel on a cableway between Smithfield and Kuranda. Get to know the Southern Cassowary – a large, flightless bird that lives in the rainforest. Since 1935, the Barron River (near Skyrail’s Barron Falls Station), has been used to develop renewable energy for the surrounding region. Skyrail offers impressive views over the valley. Your Skyrail Rainforest Cableway experience ends in Kuranda, a small and fairly touristy mountain village. Surrounded by World Heritage Rainforest and a thousand feet above Cairns, the Kuranda area is the traditional home of the Djabugay people, who know Kuranda as Ngunbay ”place of the platypus”. The first Europeans settled here in 1885, working in timber felling, agriculture and grazing. Over time, Kuranda made itself a name as tourist destination, the “Health Resort of Queensland”, providing a cool mountain retreat away from the hot and humid tropical coast. In the 1960s, Kuranda was “invaded” by Hippies, attracted by the alternative lifestyle. Hand-made arts, crafts, jewellery, soon became an attraction by itself, now known as Kuranda Heritage Markets: a lively mix of stalls and restaurants. Ever drank from a coconut? Here’s your chance. 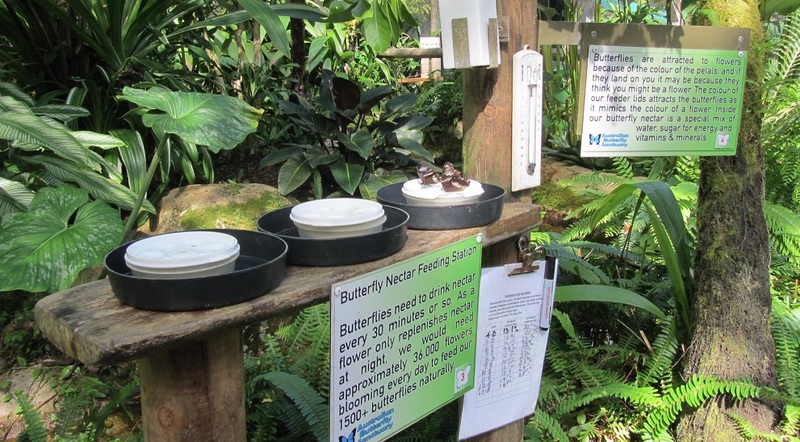 Kuranda Village also hosts a couple of zoo-style sanctuaries: the Australian Butterfly Sanctuary (our favourite), Birdworld Kuranda and the Koala gardens where – if you must – you have a chance to have your picture taken holding a koala. Perhaps more authentic wildlife encounters are the Riverboat Tours, a 45 minutes wet tropics Rainforest cruise along Barron River. 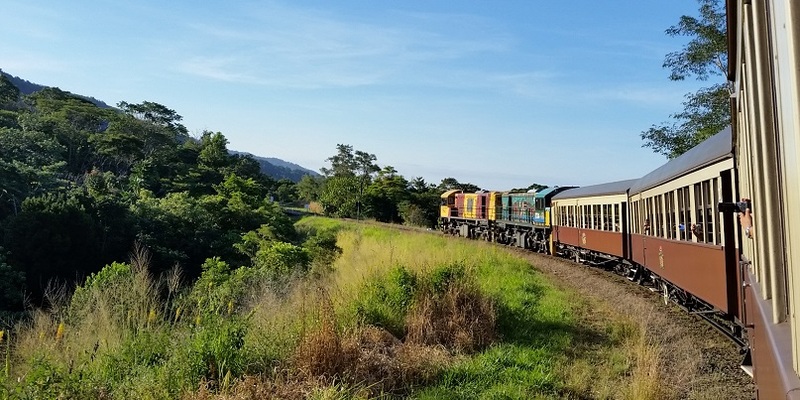 If you’re into trains and engineering mastery, make sure to hop on Kuranda Scenic Railway, whose carriages date back to early 20th century. 1,500 men – mostly from Ireland and Italy – were involved in constructing this truly ambitious railway, connecting coastal Cairns with Kuranda Village 327 meters higher, up in the mountains, along a total of 37 kilometres. Throughout the journey, live commentary explains the history and milestones of this Heritage Railway. The train is popular with tours – especially Japanese, so you might get a language lesson as well. Hard to believe but the 15 tunnels (1,700 meters in total) were all hand-carved, with some of the 55 bridges offering spectacular views all the way out to Green Island at the Great Barrier Reef. Final stop of the train is Cairns Central station, from which our recommended budget accommodation, YHA Cairns Central, is just across the road. Ready to go? Start your Skyrail Rainforest Cableway experience now by checking availability and rates. Like our review of Skyrail Rainforest Cableway and Kuranda Scenic Railway in Cairns, Australia? Share and spread the word!